The galaxy NGC 253 in the constellation Sculptor was discovered on 23.09.1783 by Caroline Herschel in England with a small 11.5 cm telescope. NGC 253 is the largest and brightest member of a galaxy cluster in Sculptor with a distance of about 13 million light years. The absolute diameter is about 95,000 light years, so the galaxy is slightly smaller than our Milky Way. 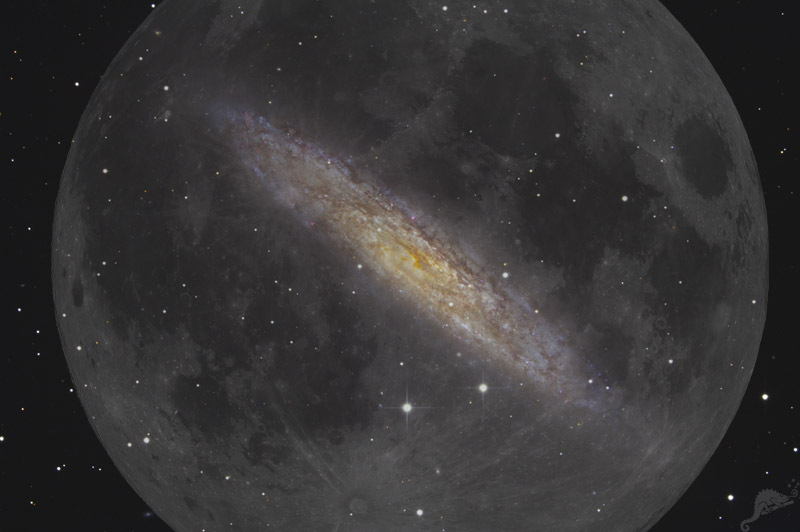 The image at right shows a comparison to the size of the full Moon. Click here or the thumbnail to load a larger image . NGC 253 is a typical starburst galaxy with a high rate of star formation. The striking dark gas and dust clouds are also further building material for numerous future generations of stars. In contrast to other spiral galaxies, the yellowish light inside the galaxy is only partly derived from an older and cooler star generation. In addition, the brightest area of the center shows signs of a strong star formation that has lasted for about 30 million years. Due to the high dust content, the bluish light of the bright and hot stars is clearly reddened and can be seen as a yellow-orange glow. In contrast to other spiral galaxies, the yellowish light inside the galaxy is only partly derived from an older and cooler star generation. In addition, the brightest area of the center shows signs of a strong star formation that has lasted for about 30 million years. Due to the high dust content, the bluish light of the bright and hot stars is clearly reddened and can be seen as a yellow-orange glow. Due to the relatively small distance, some globular star clusters can be detected in the image, which are marked in the labeled version. marked in the labeled version. 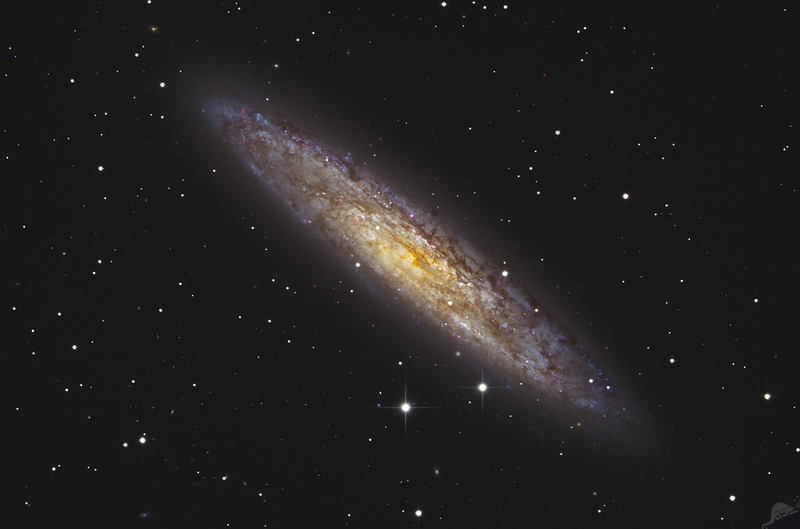 NGC 253 is a spiral galaxy with a central bar, which we see under a very shallow angle of only 11 degrees. The bar as well as the spiral arms can be well observed in the infrared spectral range, as shown by the ESO VISTA telescope on the right. This allows you to see through some of the dense dust clouds and to better understand the structure of the galaxy. The VISTA image can be enlarged by clicking on it. 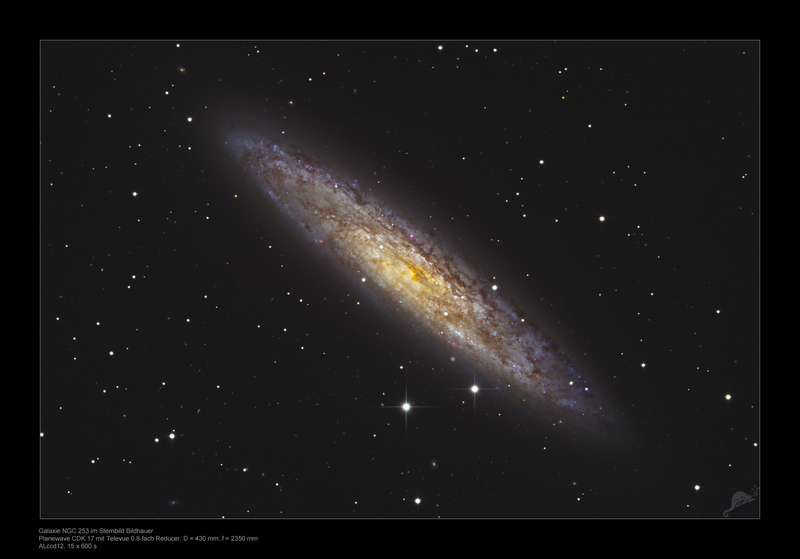 The small galaxy PGC 198197 on the upper left edge of the NGC 253 is another interesting object in this image. 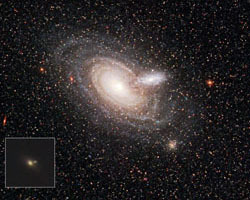 By chance, two differently distant galaxies are superimposed in the sky. 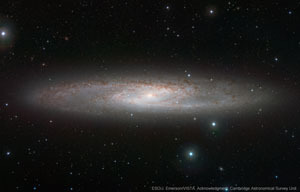 This constellation offers a unique possibility to examine the structure of the foreground galaxy. The large area of the dust clouds of the foreground galaxy is surprisingly far into its outer regions. 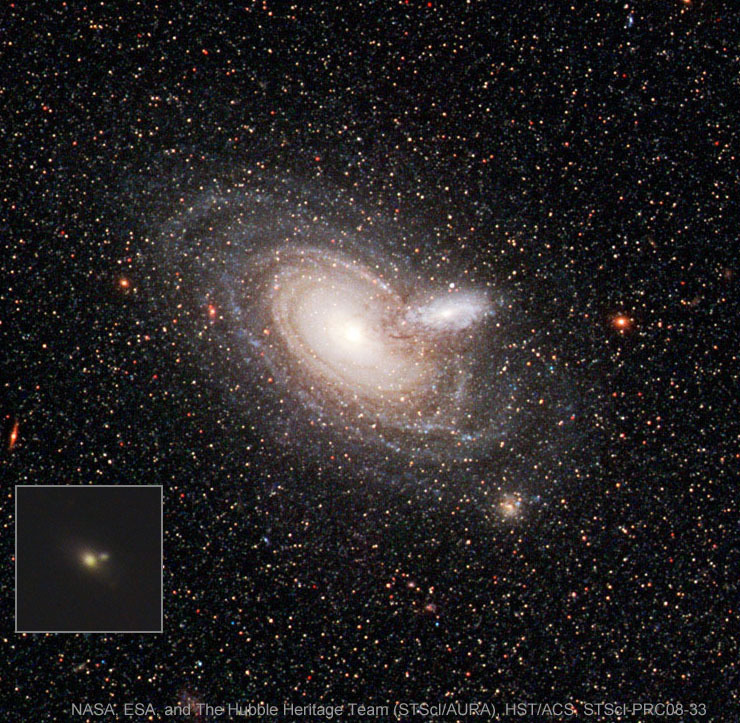 The image on the left shows the comparison of PGC 198197 between our image with and the high-resolution Hubble version which can be enlarged by clicking on it..
Holwerda et al. (2009), The Astronomical Journal, V. 137, S. 3000: An extended dust disk in a spiral galaxy: An occulting galaxy pair in the ACS nearby galaxy survey treasury.